If you're on twitter you must have definitely needed to access it from the BlackBerry at some point, and most probably have been using some app for the same. 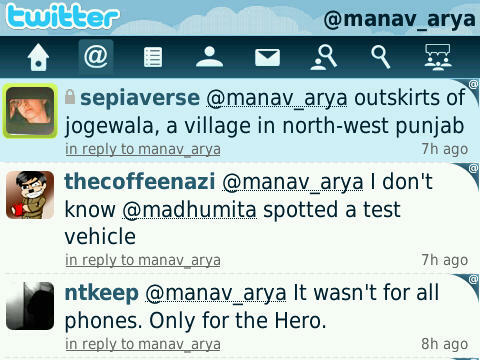 The official Twitter for BlackBerry app got a lot of attention when it was announced and when they opened up the beta. Now that its finally out in the open , we can find out if it does live up to the expectations of a twitter addict. 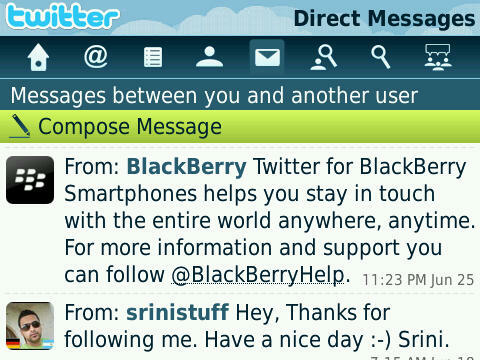 Twitter for BlackBerry is the official RIM Twitter app (meaning its developed by RIM) It allows you to do almost everything that you could do through their mobile website or a desktop application. The app is freely available from the BlackBerry App World or you could download it from here or the BlackBerry website at www.BlackBerry.com/twitter if you don't have a twitter account you can sign up for one right inside the application. After you sign-in you can see your twitter timeline, and are also presented with a opportunity to follow @BlackBerryHelp a neat twitter account that RIM operates and would help you with questions regarding anything BlackBerry. The entire interface is neatly designed with a navigation bar on the top that lets you access all functionalities that twitter offers. 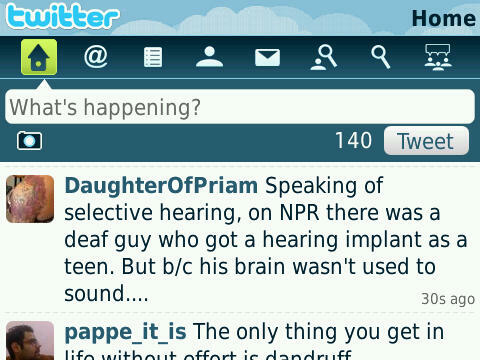 On the main screen you can notice your twitter timeline and a box where you can update or "tweet" your latest status. 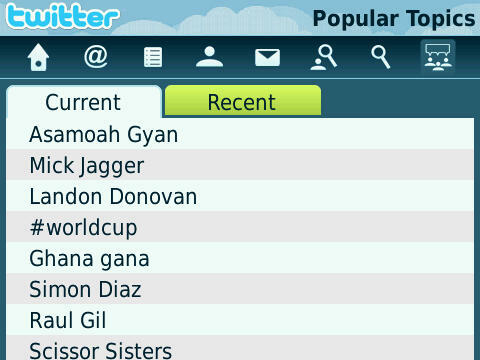 And if you can also update a photo along with your tweet using the inbuilt twitpic (requires sign-up) service. 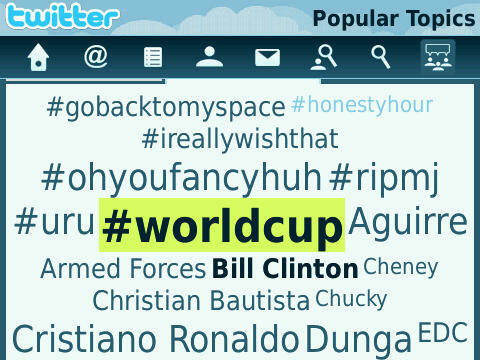 The search functionality of the Twitter for Blackberry application is quite powerful and can be used to track down specific information and it even features a trend screen where you can look at the latest twitter trends. You can check out the current top 10 trends as well as a recent trends screen where the trends are displayed in a neat cloud view. Clicking on any word in both the screens instantly invokes a menu that allows you to search or tweet about that specific trending topic. 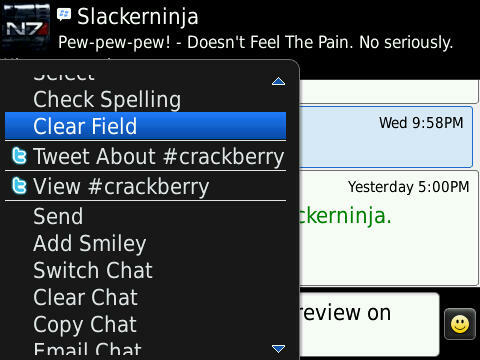 Another amazing aspect of the application is the integration into the BlackBerry context menu. 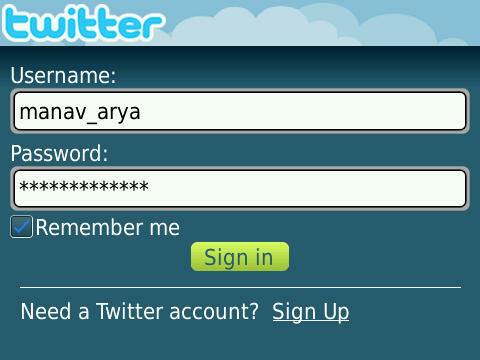 If there is a #topic or @username mentioned in any conversation, email or document which is open on the BlackBerry clicking on it immediately invokes twitter specific actions (to search, view user profile etc.) This is a very useful feature and I have not seen it on any other twitter app so far. 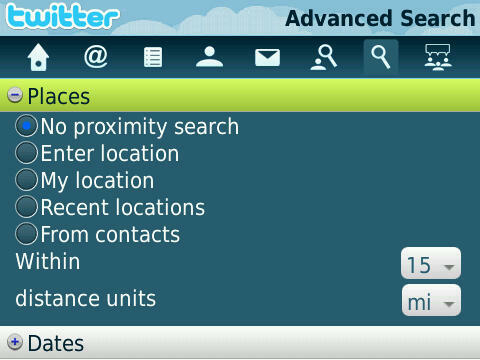 As a power user I have tried many Twitter apps on the BlackBerry like Seesmic and UberTwitter, there are aspects that I like and dislike about the client. One of the downsides might be that Twitter for BlackBerry doesn't support some advanced 3rd party twitter features like geo-tagging and other media services (for uploading videos) And it doesn't offer a plethora of options to customize. The in-line image previews and autocomplete for @usernames is a welcome feature. And so is the navigation bar based interface and keyboard shortcuts allow you to quickly move around through the application. Since this is an official RIM application I do expect it to be updated frequently and it is quite polished and manages to please both the average and power user. This is definitely my favorite twitter app and I would highly recommend it. Does not support geo-tagging and other 3rd party add-on's.